One of the ways to overcome this is Air Polishing – an effective way of removing the unwanted staining from your teeth and the cost isn’t always as expensive as you might think. 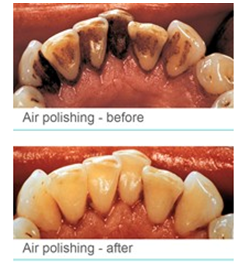 Air Polishing is a quick treatment of only 10 minutes and is completely pain free! Although further sessions may be required, you will notice immediate results. Prices range from £20 per session. If you consume excessive amounts of tea, coffee, wine, tobacco or any other food or drink that contains strong colouring then your teeth will become discoloured. There is also people out there who have a normal healthy diet, and over time again their teeth become discoloured. The end result leaves your teeth spotlessly and beautifully polished. Many patients are very pleased and surprised of how easy and effective the treatment is and therefore recommend it to all patients. So if you are interested in Air Polishing in Glasgow you can call or book online now. 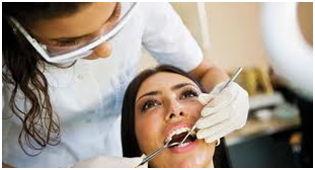 The procedure includes fine particles of silica projected onto the teeth. The teeth are then gently polished allowing access to all the hard-to-reach areas. This then scores away any stains, plaque and trapped food particles. This will then restore the teeth original whiteness, leaving then stain free! Air Polishing does not require a local anaesthetic and is a gentle method as it doesn’t generate any heat or pressure so it is an ideal choice for patients with stained teeth and patients who experience dental anxiety.